Argentine authorities say that Buenos Aires will be an armored city when world leaders arrive for this week’s G-20 summit. But security failures that marred a soccer championship and deeper unrest over an economic austerity program are now raising concerns about the country’s ability to ensure safety. About 22,000 police and security agents will guard U.S. President Donald Trump and other leaders from the Group of 20 industrialized and emerging nations during the two-day meeting that starts Friday. At least another eight U.S. aircraft and up to 400 American military personnel and civilians are expected to provide security. 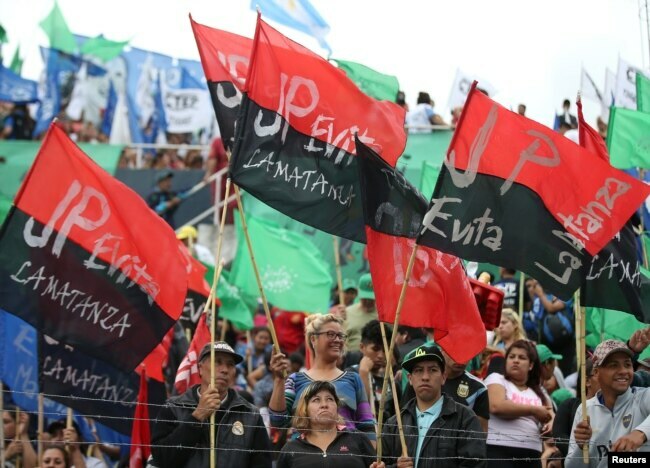 Even with beefed up security, however, the Argentine government will inevitably be facing demonstrations that could potentially draw thousands of activists, some of whom might be coming from other parts of the world. People hold flags during an anti-capitalist meeting at a local stadium, ahead of the Group of 20 gathering, in Buenos Aires, Argentina, Nov. 27, 2018. Anarchist and anti-capitalist groups have announced that they will stage protests under the slogan “Get Out G-20, Get Out IMF,” while messages posted on social media are demanding the ouster of Trump and other leaders, such as Brazil’s far-right President-elect Jair Bolsonaro, who will take office on Jan. 1. The summit comes just days after an inopportune soccer-related incident also threw public security measures into question. Critics say that police on Saturday failed to prevent an attack on players from the Boca Juniors soccer club when River Plate fans hurled stones and other objects at their team bus as they were headed to play a championship match. Several players, including the team captain, were injured when a bus window shattered, while others were affected by tear gas and pepper spray used by police to contain violence. Fans also vandalized cars and other property near the stadium, ultimately leading to the postponement of the Libertadores Cup final. Argentina is the first South American country to host the G-20 summit, and officials have the added challenge of ensuring that chaos is better contained than it was at last year’s meeting in Hamburg, Germany. 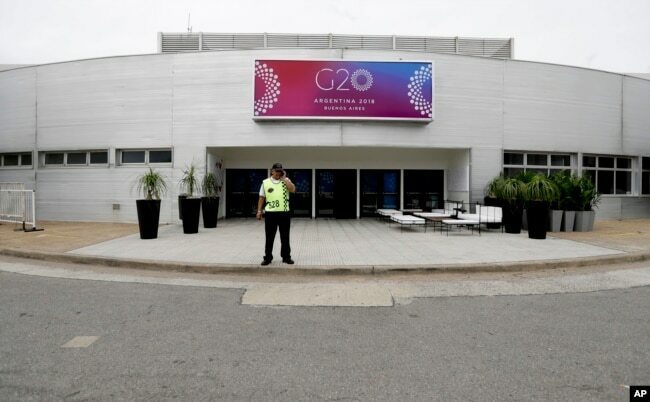 A security guard stands outside the G20 summit venue at the Costa Salguero Center, Buenos Aires, Argentina, Nov. 27, 2018. At that summit, a 38-square-kilometer (almost 15-square-mile) “no-protest zone” encompassing the airport in Hamburg was blocked off as clashes broke out between police and protesters. Authorities have reiterated that they’ll crack down on any effort to disrupt the gathering and will not tolerate violence. “Whoever manifests does so in the framework of peace and free expression and not in that of violence,” said Minister Bullrich. Regardless, unrest is already bubbling beneath the surface. Earlier in November, two attempted attacks using homemade devices were made on a judge’s home as well as the mausoleum of a police chief; false bomb threats on a bank and a train station added to the sense of unease. Argentines have also taken to the streets in mass in recent weeks to demand solutions to the country’s economic crisis and reject government austerity measures implemented in response to currency and inflation problems. The crisis has forced President Mauricio Macri’s government to seek a $56 billion credit line with the International Monetary Fund this year and has been a source of discontent for those who have bad memories of a 2001 crisis when banks froze deposits and people were prohibited from withdrawing their savings. Macri, a pro-business conservative who came into office in 2015, had promised to trim Argentina’s fiscal deficit, reduce poverty and curb inflation. On Monday, he said he regretted the violent acts before the soccer game and tried to calm fears about the summit. National Security Minister Bullrich herself admitted that ensuring safety during the Boca-River game would be a “minor” thing compared to the huge challenge of securing world leaders and other participants during the G-20. But she also said Argentina was up to the task. The government said that the train and subway systems in Buenos Aires will be closed during the meeting, and authorities will cordon off a wide area near where the summit will be held. An airport located in the city will be exclusively available for officials arriving for the gathering, although the Ezeiza international airport on the outskirts of the city will operate as usual. The mounting challenge of welcoming the leaders and about 15,000 people has also prompted the Argentine government to stock up on equipment, including bulletproof vehicles, high-powered motorcycles and bomb scanners purchased in China. In addition, the security ministry has established ways to monitor radiological and nuclear activity, track explosives and reinforce border controls. The government says it is in close contact with foreign authorities to block troublemakers and avoid riots. Friends and family pay tribute to Emiliano Sala.